Evil has many guises, and Jack Taylor is personally acquainted with most of them. But nothing has ever truly terrified him – until he encounters a group called Headstone. An elderly priest is beaten, a special needs boy brutally attacked. As another appalling act of violence alerts Jack to the horror spreading through Galway City, he realises he must fight back. But to do so, and win, he knows he must relinquish the remaining shreds of what makes him human. And he’s not sure that even he has got what it takes . . .
Another Jack Taylor novel and another triumph for the man who is fast becoming one of my favourite crime authors. 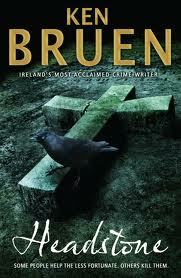 Ken Bruen simply doesn’t mess about, his stories are tight, language uncluttered and fast, dialogue current and peppered with reference lists that always have me checking my bookshelves, movie collections and CD racks – they really are crime books for our time. He uses pop-culture and, through recent movie adaptations of his own books (London Boulevard and Blitz) has become something of a pop culture icon himself, as well as always being cited as a crime writer than many other crime writers look up to and respect. But, as usual, and even moreso in this book, you have to hand it to Jack Taylor for being the voice of reason, the imperfect hero, the heavy-drinking and yet reliable Jack that fans have become so fond of as he strives to help those around him by any means at his disposal. It’s rare that an author takes the risk to damage his characters from book to book in anyway that will carry through, with the other exception that springs to mind being Ray Banks, but the emotional damage that Taylor has been through in previous novels is clearly here and shapes and determines his way of dealing with things. In Headstone, I think Ken Bruen has also upped the ante in terms of how many times Taylor also gets a physical battering. With a great story leading up to a chilling end game, and plenty of Guinness and Jameson to keep you warm inside along the way, this is a great start for anyone yet to experience a Ken Bruen / Jack Taylor novel and a worthy novel to sit alongside the others in the series so far. Top stuff – check it out here.